The glossed concepts bilingual/ism and bilingual education (BE) have been recognized as being simplistic and misrepresentative of the complex, diverse human behaviors that they index. Moving beyond colonially framed monolingual, monoglossic understandings of bounded language systems and recognizing the fluid nature of languaging where more than one language variety, modality, and other resources constitute routine human communication, this chapter presents the place of signed languages (SLs) inside and outside education, as well as social life across time and space. It traces salient developments as well as the erasure and hegemonies related to the position accorded to different language varieties and modalities inside and outside deaf education (DE). This chapter identifies and accounts for the place and meaning of SLs in BE broadly and DE specifically. In addition to presenting an overview of the binary divisions (related to oralism/signing, deaf-normal/hearing, segregation/integration) that have plagued the field as well as research in the domain DE for over a century, this chapter highlights the establishment of a third position in terms of the place and space that is accorded to SLs both across time and space generally, and in BE and in DE research specifically. Significant issues that continue to frame the education and the situation of deaf children and adults and specific paradoxes in the areas of both education and research are up-fronted. The chapter presents key directions for future research taking cognizance of recent discussions in the language and learning sciences more generally. 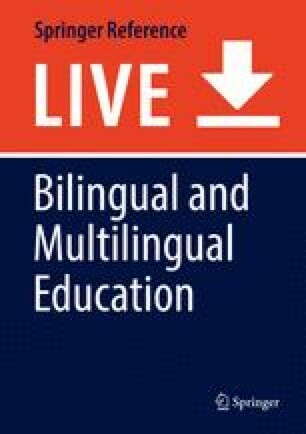 The terms bilingualism and bilingual education (BE) have been recognized over time as being simplistic, if not misrepresentative of the complex and diverse set of human behaviors that they index (Baker 2011; Garcia 2009; Grosjean 1982). A concern here relates to moving beyond dominating (colonially) framed monolingual, monoglossic understandings of bounded language systems, to recognize the fluidity inherent in languaging and translanguaging , including multimodalities that comprise the heteroglossic nature of human communication (Blackledge and Creese 2014; Hasnain et al. 2013; Garcia 2009; Linell 2009). In addition, different BE models like two-way bilingual programs, content- and language-integrated programs, plurilingual/multilingual programs, segregated programs, etc., are ideologically framed sites of contestation and are not uncommonly connected to academic fields of expertise in either the language sciences or the education sciences . This means that the institutional activity system of BE is often seen as an extension of the theoretically framed domain in research called BE (Bagga-Gupta 2012). Different signed languages (SLs) have also been, and continue to be, framed in simplistic/reductionist terms in both the popular imagination and in some dominating scientific domains. Different SLs have evolved and exist in different communities where large numbers of members are deaf (Groce 1985), in a similar fashion as different oral languages have evolved in hearing communities. In other words, SLs are, at least since the 1960s, recognized within science and, since the 1990s in national policy contexts, as unique human languages, similar and just as complex in their makeup as oral/articulated languages (OLs). Five types of cheremic unit variation in SLs, similar to phonological variation in OLs, are recognized: handshapes, sign location, palm orientation, movements, and nonmanual embodied features. While SLs are often denied recognition and continue to be contested in policy as well as in some scientific domains, they have existed in different formats in communities worldwide, and especially so within deaf education (DE) even in institutional settings where they have been formally forbidden. This chapter aims to identify and account for the place and meaning of SLs in BE broadly and DE specifically. While I will give an account of the field, I will steer clear of the binary hegemonic ideologies that have continued to frame understandings related to SLs on the one hand, and BE, including DE on the other. Using brush strokes across the canvas (rather than specific areas on the canvas or individual colors or lines), my aim here is to trace salient developments and make visible the multiplicity of mainstream academic domains that contribute to and intersect in the field SLs in BE. Recognition of the existence of groups and communities that use/used a specific SL predates the academic and/or political recognition awarded to specific “national” SLs in terms of a natural human language . The former include descriptions of the communicative repertoires in, often isolated, communities on islands, or remote areas (Fox 2007; Groce 1985; van Cleve and Crouch 1989). The latter saw academic recognition accorded to American Sign Language (ASL) in terms of a “real” language in the 1960s (Bauman 2008; Maher 1996). In the decades that followed, linguistic work emerged in different parts of the world with the aim of “codifying” SLs in national contexts and it is only in the last two decades that political recognition has been awarded to a dozen or so SLs in the world. While some SLs like Finnish Sign Language (FinSL), Uganda Sign Language (USL), and Venezuelan Sign Language (VSL) have been awarded the status of national minority languages in their respective nation-states, others like ASL, Norwegian Sign Language (NSL), and Swedish Sign Language (SSL) have been awarded recognition in terms of “languages of instruction,” primarily for the deaf. European-American narratives dominate the accounting of the development of institutionalization of DE, including BE where the second half of the 1700s sees schools being set up for deaf children of the rich and the poor in France. Individualized or small group education of deaf children of the rich, emerged in Europe earlier in the 1500s with the aim of teaching them to speak orally, in addition to learning reading and writing. The experimentation of the teaching of groups of deaf where signing was privileged in France (by a teacher of the deaf, Abbé de l’Épée) is taken to the USA in the early 1800s by a hearing North American (Thomas Hopkin Gallaudet). In addition to learning about the model there from a hearing teacher (Abbe Sicard), Gallaudet brings back to North America a deaf French SL teacher – Laurent Clerc. ASL is accounted to have emerged from the local SL in conjuncture with the imported French Sign Language (LSF, langue des signes française). Of interest for present purposes is the fact that the ASL-American English model of teaching that emerges is termed “signing,” rather than “bilingualism.” Deaf and hearing teachers learn ASL and the use of two languages in DE spreads across the continent. Another point to note here, and one that is often erased in discussions of SLs in DE, is the close hearing-deaf collaboration that allows for the setting up of LSF-French schools and later ASL-American English schools in different spaces during the 1700–1800s. The hegemony of the oral method continues well into the second half of the 1900s. Presentations that support “total communication as a philosophy of education” emerged first at the 13th ICED in 1970 (Brill 1984, p. 247). The combined use of signing and talking, i.e., “total communication ” (TC), thus becomes reestablished nine decades after signing was banned in DE. The congresses of 1975 and 1980 saw a small but important rise of deaf participants at ICDE. equal and appropriate access to a multi-lingual, multi-cultural education; inclusion of Sign Languages as legitimate languages equal to the nation’s spoken languages; the inclusion of Deaf people in all aspects of education from the very onset; and the promotion of human rights for all (http://wfdeaf.org/news/international-congress-of-the-deaf-iced-july-18-22-2010-vancouver-canada). Two further relevant dimensions regarding developments vis-à-vis the place of SLs in education relate to (i) technologies and (ii) signing for hearing individuals, e.g., for babies, for children with cognitive disabilities and in “foreign language” college courses. Technology plays an important role in the lives of deaf people generally, and in DE specifically (Holmström 2013). The dominance accorded to oralism at the end of the 1800s allows audiologically oriented technologies to become relevant for augmenting language acquisition in DE. Understandably then, advances in hearing technologies like outer-ear hearing aids (1950s onwards) and inner-ear aids, i.e., cochlear implants (latter parts of the 1900s onwards), have, in medical/technological research quarters, been heralded as “cures that can eradicate deafness” (Blume 2010; Thoutenhoofd et al. 2005). Equally potent counter stances, taken by cultural/linguistic factions within science as well as professionals and community proponents of signing, include the assertion of a discourse of “deafhood” where the medical/technological eradication discourse gets framed as “linguistic-cultural genocide” (Ladd 2003; Skutnabb-Kangas 2000). While the place of SLs continues to be contested in DE and different models of deaf BE exist, there has been a paradoxical surge of interest in and growth of signing programs available for hearing babies since the late 1980s (http://sign2me.com/index.php?option=com_content&task=view&id=17&Itemid=33). Here the role of “early signing” is accounted for in terms of enhancing the general language and cognitive development of hearing children. A similar paradoxical popularity has been noted in the ASL as “foreign language” option available to hearing college students in the USA. Furthermore, the use of a range of manual signing systems (like signed speech, signed support systems, alternative and complementary communication systems) is deployed in the education of hearing children with a range of cognitive disabilities (http://sign2me.com/index.php?option=com_content&task=view&id=17&Itemid=33). Some important issues of relevance emerge when discussing developments and the position of SLs in education, including DE across time and space. Firstly, different SLs have always existed in and around DE irrespective of the explicit oral/articulation, manual/signing, or variations of TC models in place in schools or deaf teacher education (Domfors 2000; Jankowski 1997). Furthermore, religion, philosophy, and science have played important roles in prescribing “what language is” in the domain of DE (Bagga-Gupta 2004a; Baynton 1996; Domfors 2000; Lane et al. 1996). Thus, oral communication is, across time, collated as being “true” language, and SLs have been marginalized and even forbidden. Thirdly, the pursuit of best models and pathways to literacy for the deaf frames both (i) the organization of DE and (ii) a dichotomized research field where either an oral education or a signing-based instructional model is pushed (Bagga-Gupta 2004a; Powers et al. 1998). Fourthly, a fairly consistent pattern exists across time in that the binary hegemonies vis-à-vis language and educational placements/organization for deaf children play an important role in DE and research in DE (Bagga-Gupta 2004a, 2007; Paul and Moores 2010). Finally, the labels deployed in DE can be misleading: titles of programs and models across time may not always correspond to the languaging or communicative-practices in those models (this is also an important caveat in research in DE) (Powers et al. 1998). Thus, for instance, signing instructional models are the equivalent of BE, but may not be labeled as such, and what is called “bilingualism” in DE differs across time and space. “Bilingualism” gets discussed at the 15th ICED in 1980 in terms of deaf immigrant pupils’ “additional” languages rather than an SL and the dominant language of the nation-state (Brill 1984). In some instances deaf bilingualism is represented in terms of an SL and only the written modality of the dominant societal language is included (Bagga-Gupta 2004a). A dichotomized philosophy frames shifts in the ideologies related to language in DE where the importance of oral communication (often termed as the technical/medical perspective; henceforth Position 1) is pitted against the importance of visuality and manual- or signing-based communication (often termed as the linguistic or cultural/linguistic perspective; henceforth Position 2). This binary division can, as the previous section highlights, be more fruitfully conceptualized in terms of a heterogeneous and diffuse continuum, not least (i) given the various artificial sign-systems based upon oral language that continue to frame DE, and (ii) the non-clarity regarding the labels used for communication and the languaging in different DE models as well as in research on these models (Powers et al. 1998). Thus the oral-manual historical swings – i.e., Positions 1 and 2 – not only push an ideologically framed organization of DE but also the domain of research in DE wherein “we [researchers] have an obligation to place serious question marks [on] the validity of results regarding language ability, be it spoken, signed or written” (Powers et al. 1998, p. 33; Bagga-Gupta 2004a, 2012). Significant scholarly contributions and current work in the field SLs in BE go beyond this dichotomy and include themes such as recognition of SLs, language socialization in deaf families, sociolinguistic practices in DE, and technologies in DE. The previous section lays the basis for understanding both the general state of research in the field of SLs in BE as well as the first theme (i.e., recognition of SLs) regarding major contributions in the field. Studies by William Stokoe in the late 1960s are accredited with both paving the way for investigations that enabled ASL (and subsequently other SLs) to be viewed as a language in its own right (Maher 1996; Stokoe et al. 1965; Suppalla and Cripps 2008). While continuing efforts in science that “codify” SLs is related to demands for their political recognition, the parallel emergence of newer research traditions during the last two and a half decades is significant. While Position 2 agendas push for securing political recognition of nationally framed homogenous SLs, an emerging concern in the literature highlights the erasure of different SL varieties as a direct result of these standardizing processes. Such newer research goes beyond an endorsement of SLs in terms of “true” languages, and de facto broadens their recognition. This means that Position 1 scholars (who may continue to deny the linguistic status of SLs) may operate on the same university campuses as both Position 2 scholars (who may be closely involved in political struggles for the recognition of a national SL with deaf activists) as well as scholars working in mainstream science, not infrequently in multidisciplinary projects where the working languages include a specific SL. The perspectives of these latter mainstream scholars and their research can, for present purposes be called a (new) Position 3, not least since this emerging body of work goes beyond issues of “what language is,” “best models” for language acquisition in DE, and the “Great Divide” in DE (Bagga-Gupta 2007). These researchers merely get on with mainstream academic scholarship, focusing upon what Stokoe (in Volterra and Erting 1994:vi) calls “real data.” Historically framed research, demographic research, and research on languaging (rather than the labels of educational programs or peoples accountings of the same) both inside and outside institutional DE comprise domains that are interesting and that contribute to a Position 3 perspective. While recognition awarded to SLs since the 1960s, politically as well as academically, gives rise to discourses wherein deaf individuals become represented as members of unique minority groups with unique visual languages and gradually paves the way also for the emergence of a new discourse on “ethnicities” and deaf bilingualism, a large thrust of this work gets framed within Position 2 agendas. This Position 3 normalcy accorded to deafness is significant since instead of being disabling, it becomes merely one of many human traits of difference. Going beyond the two DE models of segregation and mainstreaming , this perspective allows for the conceptualization of an “inverted inclusive” DE model where both deaf and hearing children participate in an education delivered through an SL and a majority language. This also resembles (perhaps for the first time), the membership in the research teams focused in this section: this deaf-hearing partnership resembles the linguistic repertoires of the “bilingual” settings that are themselves under research scrutiny. Here deaf and hearing membership becomes the inclusive given, allowing for “a journey into the DEAF-WORLD” (Lane et al. 1996). While historical accounts and research on the everyday lives or the languaging of deaf and hearing people both inside and outside school settings surfaced in the 1980s, it continues to be marginal in the DE research arena. The collection of studies brought together in Volterra and Erting (1994) offers insights for the first time into not just the early communication of deaf and hearing young children acquiring SLs but also juxtaposes this with the early communication of hearing children acquiring OLs. This research highlights the inseparability of language from social interaction, including the close medley between gestural and vocal behaviors during the first few years of life. This close symbioses between different modalities (signing, written, oral language) and language pairs (ASL-American English, SSL-Swedish, NSL-Norwegian) gets conceptualized as linking or chaining and emerges as a small theme in the DE as well as the BE literature from North America, as well as Scandinavia, at the turn of the century. Individual ethnographically framed studies of parent’s languaging with infants (Andrews and Taylor 1987), case-studies of individual deaf and hearing children and/or deaf families in home and school settings (Blumenthal-Kelly 1995; Cramér-Wolrath 2013; Erting et al. 2000; Ewoldt 1991; Johnson and Erting 1989; Maxwell 1984; Padden and Le Master 1985) make available important insights regarding the linking and chaining between SLs and dominant societal languages. Ethnographically framed case-studies of individual teachers, classrooms, and schools in DE, primarily in the USA but also in Scandinavia, highlight issues of access including a significant dissonance with regard to deaf children’s access to visual language even where manual systems of signing are used in conjecture with oral (and written) language (Bagga-Gupta 2002; Bailes 2001; Erting 1994, 2001; Hansen 2005; Padden 1996; Ramsey 1997; Tapio 2013, 2014). Different deaf bilingual models have emerged in educational contexts where SLs play contrastingly different roles. In some settings variations of SLs based upon the dominating oral language are deployed, in others a “pure” SL is used parallel with the written and oral modalities of a dominating societal language, and in yet others, a “pure” SL is used parallel with a delayed introduction of only the written modality of a dominating societal language (Bagga-Gupta 2004a). While research on the use of SL interpreters within DE is almost nonexistent (Hansen 2005), Prinz and Strong (1998), in an overview, present five different approaches that bridge “the gap between ASL and written English within a bilingual framework” (1998, p. 55). For present purposes, what is relevant is the fact that these types of studies highlight the emergence of a new nonnormatively pushed discussion in a field which has long seen a dichotomized prescriptively framed agenda. Discussing three different types of technologies in DE – audiologically oriented, visually oriented and tactile oriented – Holmström (2013) suggests that visually oriented, rather than audiologically oriented, technologies tend to be not only successfully deployed by deaf pupils and individuals but that their uptake in the “Deaf World” is quicker as compared to the hearing world. Furthermore her research in Sweden shows that (i) currently almost all deaf infants are implanted and are mainstreamed in Sweden and that (ii) audiologically oriented and communicative-link technologies both support, but also limit, these pupils’ participation in mainstream education. Meta-research on the situation of cochlear implant recipients in education seems to suggest that while increased attention is being paid to specific outcomes (e.g., related to oral production) in the lives of implanted children, there is almost no research either on the impact of these technologies in broader social situations or on their impact over time (Blume 2010; Paludneviciene and Leigh 2011; Thoutenhoofd et al. 2005). These words from a quarter of a century ago hold currency even today. The parallel lives that research into SLs and DE, as well as the parallel segregated schooling of deaf children – be it in an oral or a signing environment – needs to be highlighted as a major dimension of the difficulties and confusions that continue to frame the role that different languages play in the education of children with, and those without hearing disabilities. Using the labels of the DE programs as the equivalent of the social practices, particularly the languaging in those programs is analytically problematic. Future directions for research on the role of SLs in BE need to both leave behind the “great divide” in DE and turn toward a Position 3 agenda where the focus is on (i) studying a range of issues from historical data, e.g., the ways in which deaf-hearing connectivity gets played out in communication, at work, in the “Deaf World”; (ii) demographics of deaf pupils, including deaf implanted pupils across educational settings; and (iii) the communication practices in different DE models. Tweezing out the relationship between experiences with SLs and the role they play in BE, including DE, needs to be attended to in scholarship, as does the relationship between language practices in education and children’s cognitive development (Marschark et al. 1997). More recent multidisciplinary research on the history of technologies in DE (Blume 2010; Holmström 2013) and work on the languaging in settings where SLs and dominant languages are in use by scholars in North America and Scandinavia highlight the heterogeneity of communication practices of relevance for BE more broadly. Furthermore recent works by Erting and Padden and their colleagues and by Singleton et al. (1998) have highlighted that while fluency in an SL is important for the general well-being of a deaf child, proficiency in an SL does not automatically give pupils access to the dominant societal language. These, often single research projects, need to be consolidated in larger programs in mainstream science where longitudinal studies are carried out (against the backdrop of demographic studies) of (i) implanted children in mainstream educational settings, (ii) hearing and deaf children’s educational trajectories in “inverted inclusive” educational settings where SL is a language of instruction (these resemble societies where everyone uses SLs) (Groce 1985), and (iii) families and settings where two or more SLs and two or more spoken/written languages are used. Present-day evidence from Positions 2 and 3 implies that an important future direction needs to build upon SLs as languages in their own right so that the analytic focus lies on communities where an SL is used by individuals – deaf (with or without implants) and hearing – in different arenas. “Inverted inclusive” school environments where deaf and hearing pupils and adults are members and where SLs are used in BE constitute examples of such arenas (Teruggi 2003). Taking discussions of the situation in a community like Martha’s Vineyard where no communication barriers existed (Groce 1985) as points of departure, one can raise the following query: what types of issues emerge when deafness is not a criteria for inclusion in a BE model and where a specific SL is a language of instruction for both deaf and hearing pupils? Mapping school environments in terms of such communities where barriers for deafness have been eroded is one important way of going beyond the “Great Divide” that has framed DE for a couple of centuries. Another important future direction can be framed in terms of ethics of and in research. The continuing paucity of deaf scholars and professionals in the field of DE and BE is regrettable (Padden and Humphries 2005) and comprises an important dimension of a politics of recognition. Furthermore, the involvement of industry in the field of cochlear implants and DE and their partnership with Position 1 scholars needs to be scrutinized and framed within research ethics endeavors. Thus, in addition to the multidisciplinarity of the research enterprise, the field of SLs in BE needs to be mainstreamed into science where ethical framings are highlighted. Sign 2 me. Early learning resources. http://sign2me.com/index.php?option=com_content&task=view&id=17&Itemid=33. 15 Sept 2014. World Federation of the Deaf News. ICED. (2010). http://wfdeaf.org/news/international-congress-of-the-deaf-iced-july-18-22-2010-vancouver-canada. 15 Sept 2014.